Alarm at 3:30am. Tuk Tuk pick up at 4:30am. It’s dark outside, the air is cool and breezy on the ride to the ticket office. Every day, hundreds of people get up really early and then all meet up at the Angkor Wat ticket office. From there everyone gets on the Tuk Tuk again and takes a ride to the actual temple area a little further away. 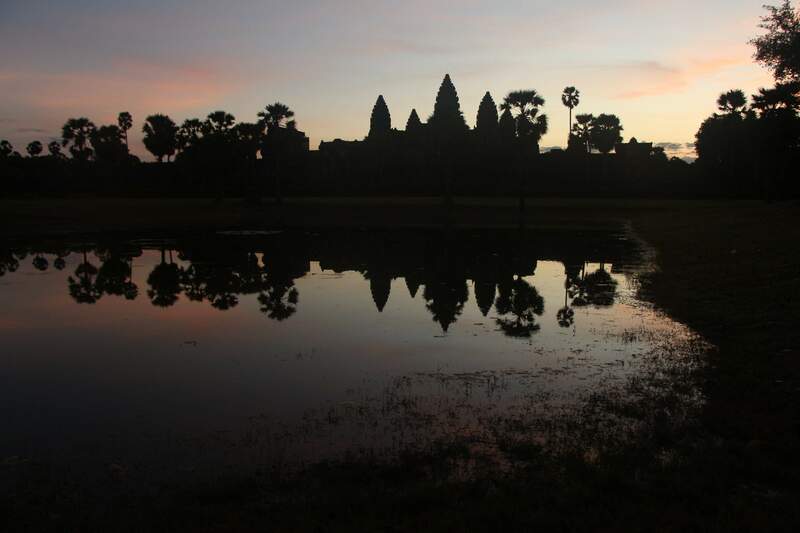 When we arrive close to Angkor Wat, the main temple of Angkor, all those people wishing fora beautiful sunrise meet again. They stream towards Angkor and most of them halt in front of the two ponds that reflect Angkor Wat and the colors of sunrise in the sky above. It is indeed pretty but not too fascinating, as I think… It’s about what you expect it to be like. A little later, as I walk through the temple, the light is just stunningly beautiful. Amazing carvings, statues, pillars are lit up by the golden morning sun. The only thing missing is someone to share it with. I’m on my own, without someone I love, and without someone to take portrait photographs of. The second temple we visit, Bayon, is even more amazing than the first one. It’s not as busy and you can find a couple spots where you’re pretty much on your own. I’m encircled by huge smiling stone faces. I sit down and feel the acient energy. My favorite temple. The fourth temple is very busy, which unfortunately steals the power of it. But it’s impressive how the enormous trees trail their roots around the old blocks of stone as if they wanted to claim the temple for themselves. People are allowed to climb parts of the ruins which are covered by deep green moss: Something that you wouldn’t experience in western countries.